Where will the world's next Zika, West Nile or dengue come from? The countries most likely to be responsible an outbreak of a contagious killer virus such as Zika or dengue have been revealed by scientists. Researchers have created heat maps to show viral hot-spots around the world, by working out which animals are most likely to spread illnesses and where. 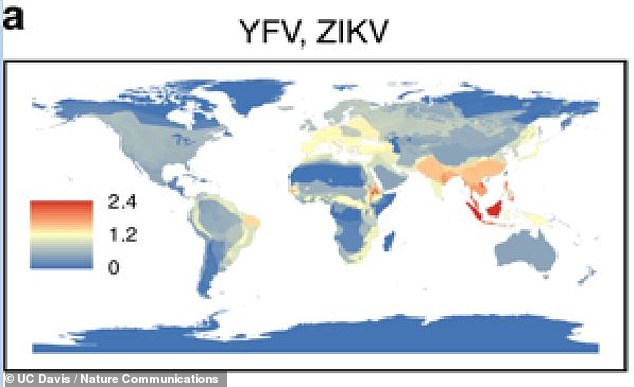 The maps show where existing flaviviruses – infectious viruses spread mostly by mosquitoes and ticks – or similar new ones are most likely to surface and spread in the future. 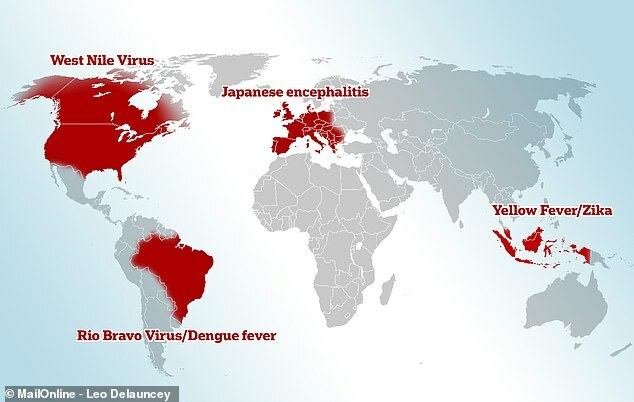 For example, Japanese encephalitis is most likely to break out in Western Europe, while the West Nile Virus is a major threat in North America. Information about thousands of bird and mammal species was involved in the study and researchers say it will help predict and track viruses around the world. Researchers from the University of California, Davis, have charted where they think future outbreaks of known viruses or similar strains will happen. Viruses such as Zika, dengue and West Nile tend to be transmitted to people – at least in the first instance – from warm-blooded animals via mosquitoes. Scientists have compared information about every known bird and mammal species on earth to work out which ones carry different types of viruses. Working out where animals are most likely to be affected by certain viruses can provide clues about where they are most likely to take hold and spread to people. They found Zika and yellow fever are most likely to break out in south-east Asia, particularly Indonesia and Malaysia, with other hot-spots in Europe and Africa. People are at highest risk of West Nile Virus in the US, Mexico and the south of Canada, with a lower but not absent risk across Europe and Russia. The St Louis encephalitis and Usutu viruses are also likely to be found in the same areas, the study found. Dengue, which is common and can cause fever, vomiting and rashes, is most likely to break out in South America in Brazil and surrounding countries. According to the research, Western Europe is most at risk of an outbreak of Japanese encephalitis, a brain infection found in pigs which can cause seizures, paralysis and even death in severe cases in humans. Tick-borne encephalitis, another brain infection, is also most likely to break out in Europe, though further to the east and into Russia. When flaviviruses infect people they often cause fevers, headaches, tiredness and rashes, muscle or joint pain and some cause nausea or vomiting. Most people only suffer mild illness and recover quickly but complications can be life-threatening. 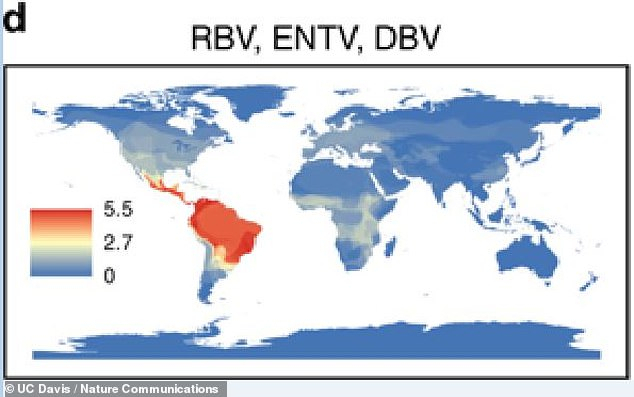 Less well-known viruses Rio Bravo, Entebbe bat and Dakar bat – the latter of which are both carried by bats – are also most likely to be found in South America. 'If there's an outbreak anywhere in the world tomorrow, we now know which wildlife species are most likely to be infected in addition to humans,' said lead author Pranav Pandit. Around 10,400 bird species and 5,400 mammals were included in the study to work out which were most likely to host contagious diseases. Some animals identified as potential carriers were associated with viruses for the first time. For example, 139 new hosts for dengue were discovered among the 173 species the study predicted could carry the virus. Researchers said the knowledge will be useful for tracking the spread of viruses among animals, because testing for flaviviruses can be difficult. If they target the correct species they can now test for diseases using non-invasive methods like taking saliva samples from sticks chewed by primates, for example. Co-author, Professor Christine Kreuder Johnson added: 'We needed this modeling technique to help us understand the most likely hosts for these viruses in their natural habitat.